Meet the candidates vying to replace Senator Rod Monroe in Senate District 24: Kayse Jama & Shemia Fagan. Ask them your questions, hear about why they’re running, and their plans for our state! Afterwards, we’ll send out an endorsement poll via email for you to cast your vote. Kayse Jama, Executive Director of Unite Oregon, was born into a nomad family in Somalia. He left when the civil war erupted, and finally found sanctuary in Portland. From 2005 to 2007, he trained immigrant and refugee community leaders in five Western states—Oregon, Washington, Nevada, Utah and Idaho—under a prestigious New Voices Fellowship at Western States Center. He has been awarded the Skidmore Prize for outstanding young nonprofit professionals (2007), the Oregon Immigrant Achievement Award from Oregon chapter of the Immigration Lawyers Association (2008), the 2009 Loweein Trust Award, which is presented yearly to “that person who demonstrated the greatest contribution to assisting the poor and underprivileged in Portland,” and the 2012 Portland Peace Prize. As a mom and a civil rights attorney, Shemia has a proven record of standing up for working families with an unparalleled sense of urgency. Oregon’s greatest challenges like housing, education, and healthcare are more than just empty statistics for Shemia. For most of Shemia’s childhood her mother was homeless in East Portland. She was raised by her father who struggled to provide food and healthcare. Thanks to great Oregon schools, Shemia was able to put herself through college and law school. Her first legal job was as a pro-bono attorney for Oregonian’s facing evictions to ensure that their rights were being upheld. On the David Douglas school board and in the Oregon House Shemia lead the fight to protect Oregonians’ healthcare, raise the minimum wage, and fully fund our schools. Today, Shemia is running to bring that fight to the Oregon Senate on behalf of East Portland. Bernie PDX Election Endorsements – Vote! 1) Should Bernie PDX endorse Julia Degraw for Portland City Council Position 2? 2) Should Bernie PDX endorse Andrea Valderrama or Jo Ann Hardesty for Portland City Council Position 3? 3) Should Bernie PDX Endorse Rachel Prusak for Oregon House District 37? 4) Should Bernie PDX endorse the STAR Voting for Multnomah County Elections Ballot Measure? Results and endorsements will be announced shortly after voting ends. Check out BerniePDX.us or Facebook.com/BerniePDX for more information. Thank you for sharing your voice! Meet the Potential BerniePDX City Council Candidates! Tuesday, Jan. 16, 6:45 – 9:15 pm: Meet the potential BerniePDX Portland City Council candidates of 2018: Julia DeGraw (Pos. 2), Jo Ann Hardesty (Pos. 3), & Andrea Valderrama (Pos. 3)! Meet the candidates, ask them your questions, and hear about their plans for our City! Julia DeGraw is running for Portland City Council (Position 2) because it’s time for City Hall to prioritize the needs of the people over developer profits, corporate interests, and complacent politicians. Julia has a history of winning campaigns that do this, like preventing Nestlé from bottling public water in the Gorge. Join Julia in creating a bold future for Portland that includes a home for everyone in need, living wage jobs & union rights for workers, and permanent Net Neutrality with municipal broadband. Working with people across the city, we will end Portland’s Jim Crow-era at-large election system by creating City Council districts to achieve equitable representation for all. Julia won’t accept contributions from corporations or developers; she stands with the people. Learn more at julia4pdx.com. After serving in the Navy, Baltimore native Jo Ann Hardesty found her home in Portland, OR when she began community organizing for Oregon’s Black United Fund in 1990. Jo Ann later served in the Oregon House of Representatives from 1995 to 2001, representing North and Northeast Portland. Jo Ann was elected as president of the NAACP Portland Chapter in 2014, after her efforts to revitalize the oldest civil rights group in Portland. She also is currently a member of the East Portland Action Plan and Vice Chair for the board of Human Solutions. As a community leader and activist, Jo Ann has a long history of standing for the city’s most disadvantaged communities for nearly 30 years. She is a firm believer that opportunities to thrive in Portland should not depend on someone’s zip code or background. Jo Ann is the only candidate who proactively challenged incumbent Dan Saltzman for his City Council seat. Her campaign platform focuses on access to government, green and living wage jobs, affordable housing, and police reform. Learn more at joannforportland.com. Andrea Valderrama is a community leader, a first-generation Peruvian American, a mom, and the first person of color to serve on the David Douglas School Board. Her family came to the United States from Peru as political refugees and worked as day laborers when they arrived in the United States. After her mom survived domestic violence, Andrea grew up in a single parent household and experienced housing and economic instability. She helped support her family by cleaning houses after school and put herself through college, earning a bachelor’s degree from the University of Oregon. Today, Andrea lives in outer East Portland with her partner, two-year old daughter, and rescue dog. As a City Commissioner, her top priorities will include taking immediate action to address our housing crisis, community safety and the livability of our neighborhoods, and increasing the number of good paying jobs in Portland so families can stay, grow, and thrive here. Learn more at valderrama4pdx.com. –> Can’t make the meeting? Don’t worry, we still want your input! Keep your eyes on your inbox for the BerniePDX candidate endorsement poll. Location: Waverly Heights Church, 3300 SE Woodward St.
Tuesday, January 9, 7-9 pm, at the Watershed Bldg, come meet the first potential BerniePDX candidate of 2018: Rachel Prusak for State Rep (HD-37)! Also – bring your ballots! During the second half of the meeting we’ll fill them out together and answer any Qs about Measure 101! Meet Rachel, ask her your questions, and hear about why she’s running and her plans for our state! Rachel Prusak is running for State Representative because she cares about people. As a Registered Nurse and proud union member, Rachel has worked on the front lines of healthcare for two decades. Rachel is running for office to help people thrive by ensuring access to affordable healthcare, investing in quality public education, and creating living-wage jobs. Rachel has administered emergency care in places like Louisiana after Hurricane Katrina; worked in rural communities across the country; and testified on a range of issues in Salem. She is a staunch advocate for Single-Payer universal healthcare. BerniePDX is proud to endorse Measure 101. We believe that every Oregonian deserves healthcare! All of us deserve to be able to go to the doctor when we are sick and get medication when we need it. Measure 101 protects the healthcare of the 1 in 4 Oregonians who rely on Medicaid (including 400,000 children). If Measure 101 fails, Oregon could be turning away $5 billion in federal matching funds. This will not only devastate our Medicaid system, but will have a ripple effect leading to increased healthcare costs for all Oregonians. 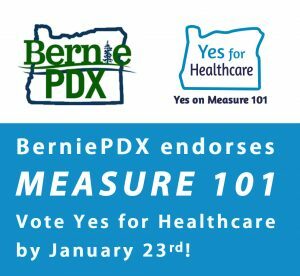 BerniePDX urges all of our members to vote Yes on 101 by January 23. Please help get out the vote by volunteering for phone banks and canvasses. Learn more at yesforhealthcare.org. • Endorsed, volunteered for, and helped elect some amazing school board candidates — Rita Moore and Scott Bailey for Portland Public Schools, and Stephanie Stephens and Ana Del Rocio for David Douglas, and also Valdez Bravo to the PCC Board. Rita and Valdez were also endorsed by Our Revolution, and were included in a special email to members nationwide! • And speaking of Our Revolution, we became an official affiliate group in October! • Continued meeting almost every week for trainings, social events, and to hear speakers on dozens of topics, including healthcare, election and campaign finance reform, immigration and prison issues, and local air pollution problems, just to name a few. We’ve been a hub for organizations to share their causes and mobilize activists. • Celebrated our second anniversary with a fantastic BBQ in September that featured some of our winning candidates and gave us a chance to celebrate and thank everyone, and acknowledge how far we’ve come since we helped organize Bernie’s first visit to the Moda Center. And we’re on our way to even more great things – all thanks to you! So what’s next for 2018? We’re hard at work on the campaign for Measure 101 to save healthcare for Oregonians (join us this Tuesday 1/2 to phone/text bank for 101). And the May elections are just around the corner! Beginning January 9, progressive candidates will be coming to our Tuesday meetings to meet BerniePDX members, answer your questions, and request an endorsement. You won’t want to miss it! If you can’t make the meetings, don’t worry, we still want your input! Keep an eye on your inbox for the BerniePDX endorsement polls. Thank you for keeping the Political Revolution alive! We can’t wait to see what 2018 has in store!